Homecambridge first B2A dialogue taken from a recent exam of the first certificate speaking. May 18, 2018 julia cambridge first B2 Comments Off on A dialogue taken from a recent exam of the first certificate speaking. 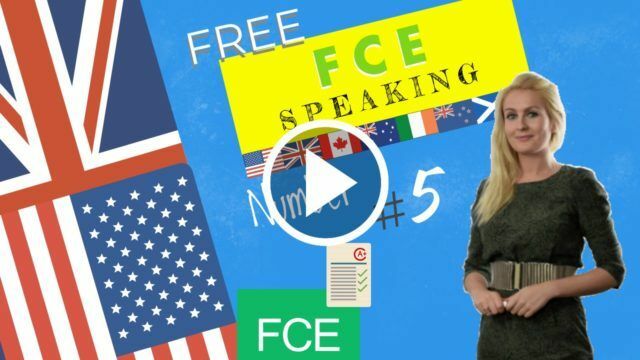 FCE Course Lesson 6 – A dialogue taken from a recent exam of the first certificate speaking with examples. A Dialogue first certificate speaking 5 with examples and exercises. In this lesson we will listen to a dialogue that is part of the first certificate listening exam. The listening consists of 4 parts with 30 questions in total. During the FCE exam you will have 40 minutes to complete this part that equates to 20% of the final grade. Then we will look at tips on how to overcome the problems with practice exercises. Do not forget to turn on the subtitles. LOTTIE: Well, you know I’m not really into this kind of thing but it is a nice painting, yes. The landscape looks pretty and as for the foreground, I can see that a hawk is perched on a branch looking at it’s reflection in the mirror. But the colour of the sky is red in the mirror instead of blue. I suppose this has something to do with a symbolic message about the painting but as you know, I haven’t got a clue about art so I don’t know why that is. GEORGIE: Wow, yes. I think that’s my favourite part of the painting. You can tell how enormous the different mountains are in comparison to the miniscule representation of the camels. It gives it a really epic feel. Right, so we’ve seen some amazing landscapes. Shall we move on to portraits?